I think this was one of the first dishes that you started cooking wasn’t it? I remember you cooking them at the Alpharetta house… I remember them being excellent even then…. I loved the ones that were crispy on one side and doughy on the other… and my all time favorite was the sauce, I think you made it with Soy sauce and Rice Wine Vinegar.. yum yum. hey cool, i have some leftover filling from egg rolls i made yesterday. looks like i could make some of these with the remainder. thanks for posting. Your welcome! 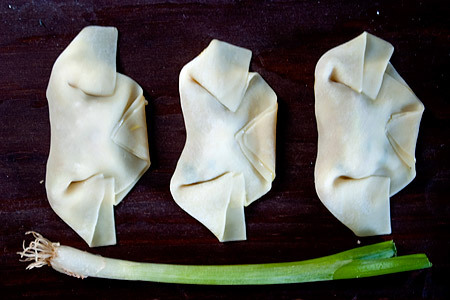 I’m sure an egg roll filling would make a great pot sticker… let me know how they turn out! Very unique looking. I’ve had and made different kinds but never seen this shape. 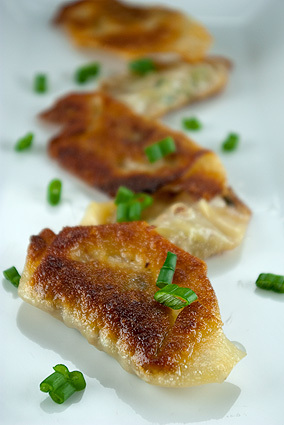 Next time I make pot stickers, I’ll try this one. Thanks.